In the multicultural northern suburbs of Melbourne in 1989, a Greek-Australian petty drug dealer disappears, presumed killed. His cousin, Epi, who works security and has ambitions to become a private investigator, is determined to find out what happened to Harry. His Greek family want to know: Is Harry really dead? Epi enlists the aid of Carol, his policewoman girl-friend, and goes about the task of behaving like he imagines a private investigator should behave to solve a crime. Asking questions, following clues, belting people and getting belted, and even finding time to take Carol out to dinner at Melbourne’s finest Greek restaurant. Despite fending off his ex-wife, having his son for a weekend visit and dealing with sarcasm from all sides, Epi actually manages to advance the investigation and discover the terrible truth about Harry. 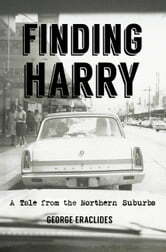 If you fancy yourself as a private investigator, you can’t do better than read ‘Finding Harry’ where Epi, Harry’s cousin, fully qualified through ‘The Manual of Detection’ shows how it’s done. Harry has gone missing in the murky world of illegal steroids and seedy gyms. Epi feels an obligation to his Greek family, and Harry’s mother, the doleful Aunt Sophia, to clear up this mystery and bring Harry home. 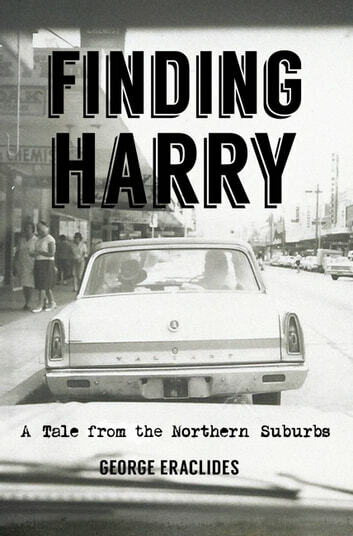 Raw, funny, and often philosophical, ‘Finding Harry’ will introduce you to a cast of hilariously inept characters from the inner suburbs of Melbourne, at a time, 1989, when the world seemed a simpler place.